Gov. 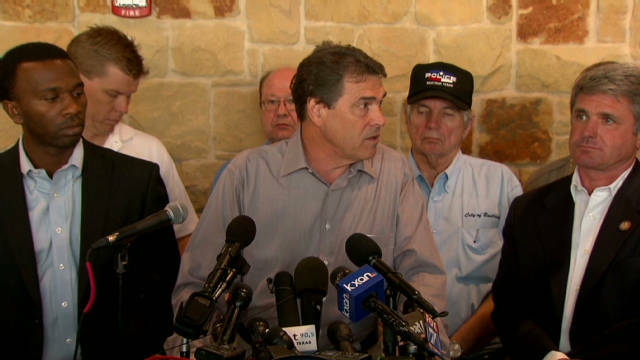 Rick Perry cautions Texans: "We got a long way to go"
Read more about the Texas fires from CNN affiliates KXAN and KVUE. Are you there? Share photos, video, but stay safe. 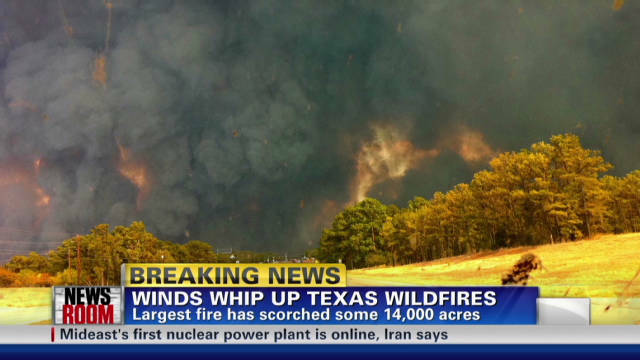 Bastrop, Texas (CNN) -- Firefighters southeast of Austin, Texas, battled strong winds Monday as they struggled to gain ground against a fast-moving wildfire that has so far scorched some 25,000 acres and destroyed close to 500 homes. Another fire in eastern Texas killed a mother and her 18-month-old child when flames engulfed their mobile home Sunday near Gladewater, the Gregg County Sheriff's Department said. "We got a long way to go to get this thing contained," Gov. Rick Perry said about the fire raging near Austin. "I have seen a number of big fires in my life. This one is as mean looking as I've ever seen." 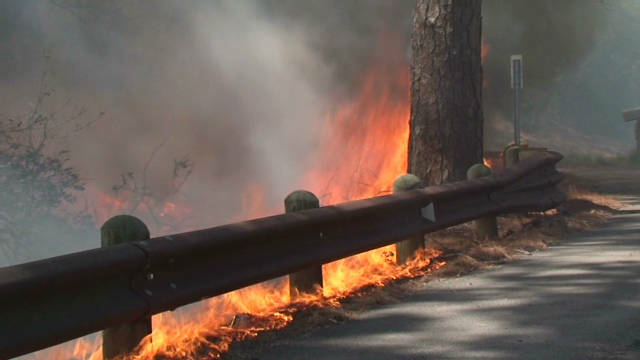 Dozens of fires are burning across the parched state, the Texas Forest Service said Monday. Earlier, the governor issued a statement in which he called the wildfire situation in Texas "severe" and said that all state resources were being made available to protect lives and property. "We will pick up the pieces. We always do," he told reporters. 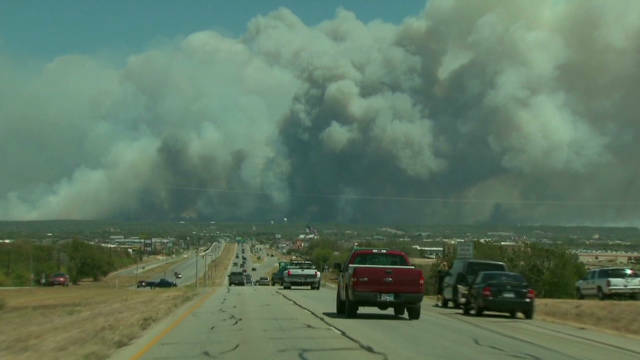 Texas is battling its worst fire season in state history. A record 3.5 million acres -- an area roughly the size of Connecticut, Perry said -- have burned since the start of the season in November as hot and dry weather, coupled with a historic drought, made conditions ripe for rapid fire growth. 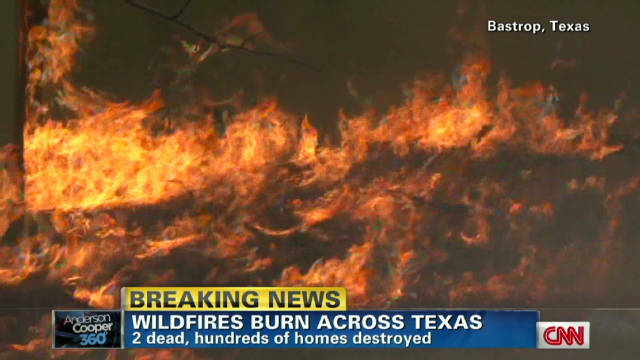 "It's a very serious, scary situation," said Jan Amen, a Texas Forest Service spokeswoman. "The drought has gone on so long -- it's just bone dry. Anything that catches fire takes off." Over the weekend, officials said low relative humidity and strong winds from Lee, which made landfall as a tropical storm but then weakened, further fanned the flames. A red flag warning was in effect for much of east, south and central Texas on Monday, with wind gusts of up to 35 mph in places, according to the National Weather Service. A fire broke out about 45 miles north of Houston Monday afternoon. It was moving between 15 and 20 mph and threatening homes, said Rhonda Reinholz with the Magnolia Volunteer Fire Department. 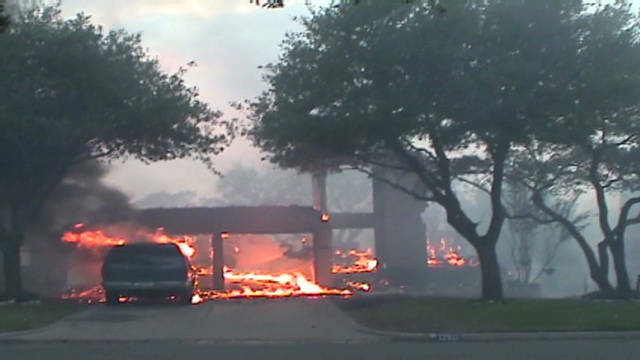 Another fire burned in the Steiner Ranch subdivision in Travis County, forcing families out of their homes. Justin Allen evacuated from there with his five kids. Though he does not think the flames will reach their house, which is tucked near the back of the development, they are close enough to worry about, he said. "It's pretty scary," said Allen. "And it's really sad for everyone that's in that path." The outbreak of wildfires prompted Perry to return to Texas from South Carolina, where he was scheduled to participate in a forum for Republican presidential candidates. The massive, uncontained fire in Bastrop County, near Austin, was the state's largest Monday. It destroyed 476 homes, according to Bastrop County Judge Ronnie McDonald, and threatened about 1,000 others, officials with the forest service's incident management team reported. 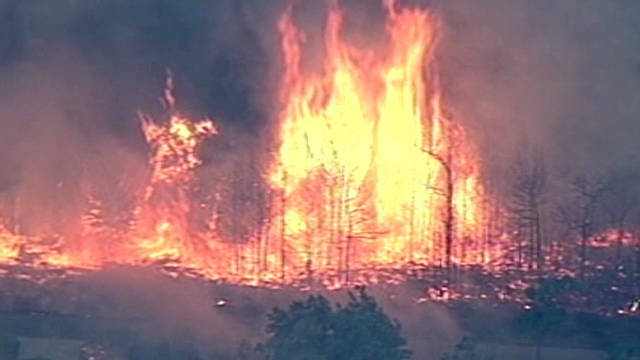 About 5,000 residents evacuated as flames approached, officials said. Lisa Ross learned she needed to leave her Bastrop home when her husband called 911 after realizing a looming fire had darkened the skies above. "You learn what is valuable in life, and it isn't the stuff," she said. "It's people in your life, and what means something to you." Cars crammed with belongings and pets packed a gas station on a highway near Austin, attorney Jonathan A. Zendeh Del said. "I've lived in Texas almost all my life, and I've never seen a fire that big in central Texas," he said. Officials issued a boil water notice for parts of Bastrop Monday. Dark clouds of smoke billowing across the sky could be seen miles from the fire. Satellite images Monday showed the fire stretching over about 25,000 acres, jumping the Colorado River and a highway, the Texas Forest Service said. More evacuations are likely as the fire spreads, officials said. Already, hundreds of people are in shelters as dangerous flames keep them from finding out whether their homes survived. "We have been told already from three people that live in that area that our house has been burnt. I had a gut feeling that it did not, but now it's looking worse and worse," said Gisele Vocal, an evacuee. "We just have to wait now." Firefighters used Black Hawk helicopters to douse flames with a mixture of water and fire retardant Monday, officials said. The fire forced parts of state highways 71 and 21 to shut and additional road closures were expected. At least 63 new fires across Texas on Sunday burned nearly 33,000 acres, the state's fire service said. Fires were reported in at least 17 counties. CNN's Jim Spellman, Antoinette Campbell, Chris Welch, Paul Steinhauser, Shawna Shephard, Stephanie Gallman and Anna Gonzalez contributed to this report.